The new BrightSource solar power plant in California’s Mojave Dessert. The plant, which uses some 350,000 garage-door-sized mirrors to focus sunlight on three boiler towers, also acts as a death ray, instantly igniting and killing any wildlife that happens to fly through the intense beam of light. Wildlife officials are concerned that this concentrated solar power plant, and others like it, could turn into “mega-trap” that decimates the ecosystem — first attracting insects, and then attracting birds that eat insects. BrightSource, in the meantime, is forging ahead with an even larger solar power plant that officials say could kill four times as many birds. 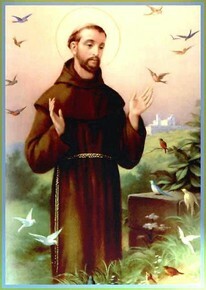 Won’t somebody stop these not-so-green nature-killing maniacs? Most of the world’s solar power is generated via photovoltaic cells — wafers of silicon sandwiched between sheets of glass that create electricity directly when struck by sunlight. 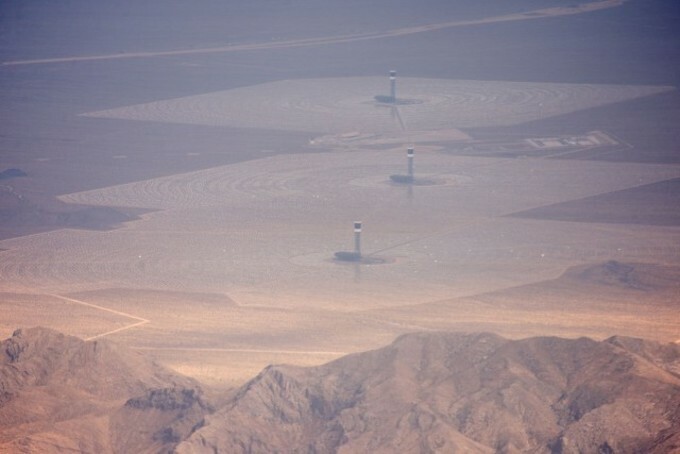 Another method is concentrated solar power (alternatively called “solar thermal power”), which uses a huge number of mirrors to focus sunlight on a tower in the middle. The tower contains some kind of fluid (super-heated water, molten salt) that in turn creates electricity via a conventional steam turbine. For a while, concentrated solar was seen as the future of solar power, but photovoltaic cells are now back in vogue after large price cuts over the last few years. 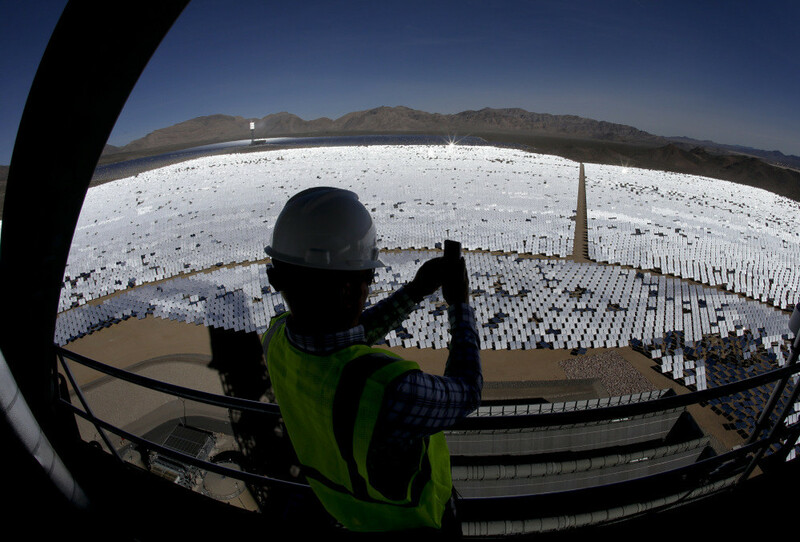 In the case of BrightSource’s concentrated solar power site near Ivanpah in the Mojave Desert, there are some 350,000 mirrors that focus light on three boiling towers (each about 40 stories high). The plant cost $2.2 billion to build, with most of the money coming from a US Department of Energy loan, and sizable investments from NRG Energy and Google. The three plants have a total capacity of 392 megawatts and an annual production of around 1,000 gigawatt-hours of reasonably priced electricity. [Read: New solar power plant is the first to go ‘supercritical’, but solar’s long-term cost and efficiency still questioned. ]Unfortunately, though, anything that happens to wander too close to a boiling tower is very rapidly cooked by the focused sunlight. Workers at the Ivanpah solar power plant call these birds “streamers,” as they ignite in midair and plummet to the ground trailing smoke. Federal wildlife investigators said there was, on average, one streamer every two minutes — or hundreds of thousands of incinerated birds per year. Another expert estimated that the number is nearer 28,000 per year. BrightSource’s own estimate is around 1,000 roasted birds per year. BrightSource is reportedly looking to build an even-larger power plant, which wildlife officials say could be “four times as dangerous” to birds. BrightSource has offered $1.8 million in compensation for the expected bird deaths. There are photos online of the cooked birds if you’re interested, but I won’t share them here; they just look like sad, singed birds. While it might sound like BrightSource has created some kind of bird-blasting death ray, it’s important to keep things in perspective. Back in January, it was estimated that — in the US alone — between 365 million and 988 million birds are killed every year by crashing into windows. We’re mostly talking about domestic, low-rise windows, too — not skyscrapers. Likewise, a study last year showed that domestic cats — yes, your beloved Fluffy — are killing more than a billion birds per year in the US. Still, while the numbers of dead birds are relatively low at the moment, wildlife experts are worried that these concentrated solar power plants could spiral out of control. They are worried that insects will be attracted to the bright lights of the towers, which in turn will attract large numbers of insect-eating birds. With enough towers, a “mega-trap” that decimates ecosystems might be created. I doubt this will be enough to turn commercial and political interests back towards nuclear power or fusion power, but who knows. Perhaps we’ll even see the inverse, with companies like McDonald’s or KFC becoming investors.